Last week during spring break, we had a beautiful day. The kids were bugging me about what to do, so I sent them outside. I didn’t ask them, I told them. Out they went for some outside play! They stayed outside for 4 hours, only coming in for 25 minutes to eat lunch. This is huge for my kids! I’m not going to lie, my kids love screens. So they needed this badly. 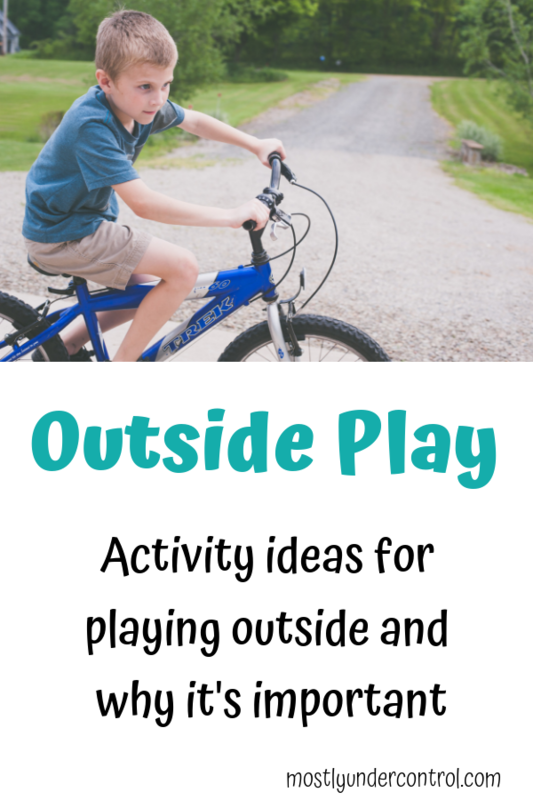 Outdoor play is pretty self explanatory – it’s play but outside. It’s large motor play and giving kids opportunities to exercise their large motor muscles, and sometimes even fine motor muscles. What are the benefits of outside play? A break for you – I’m going to be real with you here for a second. My favorite part of outdoor play is the fact that I get a break! I can send my kids outside and not worry about them. It’s glorious! Physical exhaustion – this leads to better sleep! Who doesn’t love better sleep. My kids sleep so much better when they’ve spent time outside that day. Large motor development – okay, my educator hat is back on. Outside play allows for amazing opportunities for kids to be exercising their large motor muscles which improves large motor development. This is the movement of legs, arms, motor abilities, etc. Imaginative play – Kids have so much more opportunity to work on imaginative play while they’re outside. Being outside helps improve this aspect of play. Sometimes I do like to listen to them as they’re playing outside and their play is so much more creative. Sensory benefits – There are so much more sensory play opportunities when they’re playing outside. Grass (this goes for babies, too), listening to birds, cars, airplanes, trains, playing in water, mud, dirt! Social skills – ask the neighbor to come over while your kids are enjoying outside play. This will help improve their social skills. Increases attention span – when playing outside, kids are encouraged to use their imaginations. When they are leading their own play, they are more likely to play longer. Sensory play – this is the perfect time to get messy! Take those sensory projects outside that you have been dreading because of the mess and have at it. Some of those things are: Play dough, slime, ice cube fossils, sensory bins, pom pom activities, ice cube painting, painting and moon sand. Here’s a great post from Morgan Manages Mommyhood about outdoor sensory activities. Sidewalk chalk games – bust out some sidewalk chalk and get some games going. You can even make some homemade chalk paint – it is so easy. 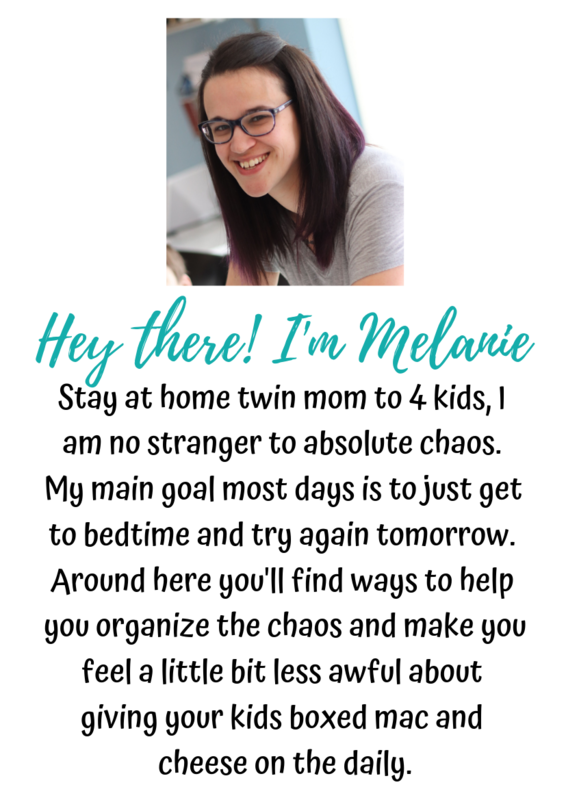 Scavenger hunt – Depending on your child’s ability, you could create a scavenger hunt for them in the backyard. Large motor painting – Get a big old piece of butcher paper and attach it to your fence or deck. Have your kids paint or spray colored water. Giant bubbles – over at Baby Savers they’re creating these giant bubbles and they are so fun! Water balloon baseball – how cool is this? Fill up some water balloons and do some batting practice! Water table – grab a water table and put more than just water in it. Cornstarch and water, ice and water, sand, dry beans, dry rice, etc. Obstacle course – Again, depending on your kiddo’s abilities, create an obstacle course. My kids (6 and 3) create them on their own!